UPDATE: Link to the source code is at the end of the blog. Atom Smasher – Game Loop Demo. This is the second installment of a series of blog entries relating to a JavaFX 2 Game Tutorial. If you have not read Part 1 please see the introduction section of the JavaFX 2 Game Tutorial. To recap in Part 1, I mention some aspects of game play and a simple demo of a prototype spaceship (comprised of simple shapes) that is capable of navigating via the mouse. Disclaimer: This is a long tutorial so if you just want to run the demo just Click HERE. The demo is called Atom Smasher where you generate atoms (spheres) that collide. You may freeze the game to add more atoms. The objective is to have more than one atom alive and bouncing around. A text displays the current number of atoms floating around. Before beginning our discussion on a game loop I wanted to give you some background history about games and animation. Back in the day (during the 80s-90s) many game programmers attempted to animate images has encountered the infamous screen flicker problem. This is where your sprites (graphic images) will often flash and make the game look quite awful. All monitors have a refresh rate where certain intervals the pixels will be redrawn (called vertical retrace CRTs). For example, if the refresh rate is 80 Hz it is approximately 80 times a second the screen is redrawn. If you are modifying things on the screen you can often be out of sync because of being in the middle of a refresh interval. What should you do about this? Well, actually there are two things that will help remedy this problem (double buffering & knowing when the cycle is occurring). Some clever developers created a technique called double buffering. Double buffering is a technique which consists of two surfaces where each takes turns on becoming the displayable surface and the other is an offscreen area (buffer surface). This technique is really a digital sleight of hand trick where the developer can pre calculate the sprites and their positions to be drawn on the offscreen surface. Once you are finished drawing on the offscreen buffer the code will switch it as the displayable surface. An important thing to point out is that we still have an issue due to the fact that we need to be notified when the refresh interval is about to begin the redraw process. In Java this ability is built in via the BufferStrategy API. So, where am I going with this? Sometimes explaining the past strategies will help us appreciate what we have today. Do we need to do this in JavaFX? Nope. Have no fear JavaFX is here! All of the issues that I’ve mentioned are all taken care of for us by using JavaFX’s Scene graph API. However, most games will still use the old fashion way of animating graphics and updating the game world called the ‘Game Loop’. Simply put the game loop is responsible for updating sprites (graphics), checking collision, and cleanup. Older game loops will check for key and mouse events as part of the loop. Since JavaFX abstracts events to allow the Scene or individual nodes to handle events the ability to listen to low level events aren’t necessary in our game loop. Shown below is a source code snippet of a typical game loop which will update sprites, check collisions, and cleanup sprites at each cycle. You will notice the Duration object from JavaFX 2.x which represents 60 divided by 1000 milliseconds or 60 frames per second(FPS). Each frame will call the handle() method of the JavaFX’s EventHandler interface in order to update the game world. Hypothetically, I’ve create three methods updateSprites(), checkCollisions(), and cleanupSprites() that will be invoked to handle sprites in the game. The above code snippet is really all you need to create a simple game or animation. However, you may want to take things to the next level. You may want to create a game engine that can manage sprites and the state of the game world. A game engine is a fancy name for a utility or library responsible for encapsulating the game world, running the game loop, managing sprites, physics, etc. This is essentially a small game framework that allows you to extend or reuse so you don’t have to reinvent the wheel when creating a 2D game from scratch. To fast forward I created a UML class diagram of a design of a game engine. Shown below is Figure 1 A JavaFX Game Engine Class diagram. In Figure 1 A JavaFX 2 Game Engine Design you will notice three classes a GameWorld, SpriteManager, and Sprite. The GameWorld class is responsible for initializing the game state, executing the game loop, updating sprites, handling sprite collisions, and cleaning up. Next is the SpriteManager class which in charge of managing sprites by adding, removing, and other house keeping for collisions. Lastly, is the Sprite class which is responsible for maintaining the state of an image (Actor). In a 2D world a sprite can contain the object’s velocity, rotation, scene node or image that eventually gets rendered at each cycle (key frame/frames per second). Plus symbol ‘+‘ denotes that a class member is public. Hash symbol ‘#‘ denotes that a class member is protected. Below is the source code implementation of the GameWorld class. Click to expand. Later you will see a class diagram depicting a simple demo game that will extend the GameWorld class (see AtomSmasher). * This application demonstrates a JavaFX 2.x Game Loop. *  <strong>initialize()</strong> - Initialize the game world. *  <strong>beginGameLoop()</strong> - Creates a JavaFX Timeline object containing the game life cycle. *  <strong>checkCollisions()</strong> - Method will determine objects that collide with each other. *  <strong>cleanupSprites()</strong> - Any sprite objects needing to be removed from play. * set the frames per second, title, and setup the game loop. * @param fps - Frames per second. * @param title - Title of the application window. * Builds and sets the game loop ready to be started. * Initialize the game world by update the JavaFX Stage. * method. The derived class should override handleUpdate() method. /** Updates the sprite object's information to position on the game surface. * @param sprite - The sprite to update. * method. The derived class should override handleCollision() method. // check each sprite against other sprite objects. // object as opposed to one hitting many objects. // To be more accurate comment out the break statement. * @param spriteA - called from checkCollision() method to be compared. * @param spriteB - called from checkCollision() method to be compared. * @return boolean True if the objects collided, otherwise false. * Sprites to be cleaned up. * Returns the frames per second. * @return int The frames per second. * Returns the game's window title. * @return String The game's window title. * cleanup sprite objects at every interval (fps). * The sets the current game loop for this game world. * representing the game loop. * manipulate in the game. * @return SpriteManager The sprite manager. * allow the developer to add JavaFX Node objects onto the Scene. 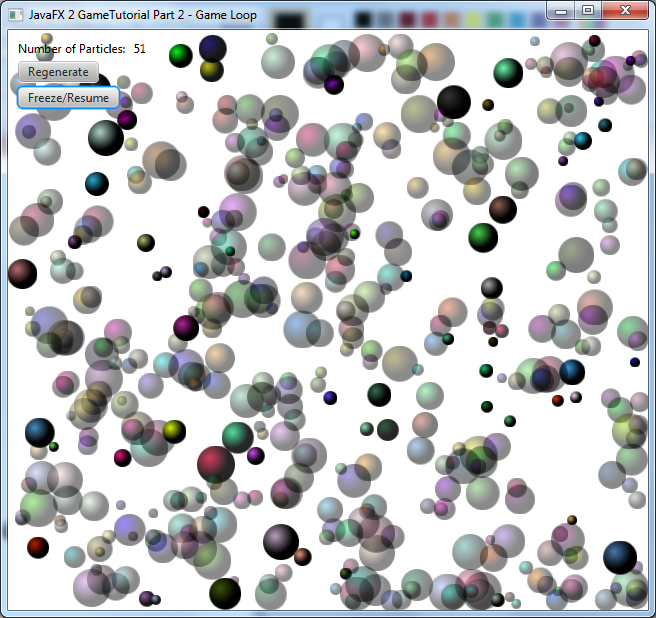 * @param gameSurface The main game surface (JavaFX Scene). * a JavaFX Group object. * onto the game surface(Scene) is a JavaFX Group object. * to be displayed into the Scene area. A sprite manager class is a helper class to assist the game loop to keep track of sprites. Normally a sprite manager will contain all sprites and each sprite contains a JavaFX Node that is displayed onto the Scene graph. Shown below is the source code. Click to expand. * later be garbage collected. Should provide some performance gain. * VarArgs of sprite objects to be added to the game. * VarArgs of sprite objects to be removed from the game. /** Returns a set of sprite objects to be removed from the GAME_ACTORS. * @param sprites varargs of sprite objects. * Returns a list of sprite objects to assist in collision checks. * list of all sprite objects called (GAME_ACTORS). The Sprite class represents an image or node to be displayed onto the JavaFX Scene graph. In a 2D game a sprite will contain additional information such as its velocity for the object as it moves across the scene area. The game loop will call the update() and collide() method at every interval of a key frame. * The Sprite class represents a image or node to be displayed. * such as rocket thrusters, walking, jumping, etc. * Updates this sprite object's velocity, or animations. * Did this sprite collide into the other sprite? * @param other - The other sprite. Whew! If you’ve got this far you are one brave soul. Let’s take a small break and try out the demo I created using the game engine above. Shown below is a Java Webstart button to launch the game demo. Later, you will see the design and source code detailing how it was created. Below is a class diagram of the game demo called Atom Smasher which uses the game engine framework mentioned earlier. Shown below is Figure 2 Atom Smasher Class Diagram. The GameLoopPart2 is the driver or main JavaFX application that runs the game. This creates a GameWorld object to be initialized and starts the game loop. * The main driver of the game. // setup title, scene, stats, controls, and actors. AtomSmasher is a derived class of the GameWorld class. It creates many spheres that animate with random velocities, colors and positions. Button controls lets the user generate more ‘atoms’ (JavaFX Circle nodes). As each atom collides with one another they will invoke the implode() method that produces a fade transition animation. You will notice how easy it is to implement this game by simply implementing initialize(), handleUpdate(), handleCollision(), and cleanupSprites() methods. Once implemented the game engine does the rest. The initialize() method creates the button controls for the user. To update the sprites positions or change the game state you will implement the handleUpdate() method. To compare all sprites if they have collided with one another you will implement the handleCollision(). The last part of the game loop’s life cycle is cleaning up sprites. Cleaning up means updating the sprite manger and updating the JavaFX Scene (removing nodes). * atomic particles. Also, the user can freeze the game. * Initialize the game world by adding sprite objects. // Display the number of spheres visible. // Create a button to add more spheres. // Create a button to freeze the game loop. * Each sprite will update it's velocity and bounce off wall borders. * @param sprite - An atomic particle (a sphere). * by zeroing out the velocity if a collision occurred. // let user know how many sprites are showing. The Atom class extends from the Sprite class. An atom is a sprite that appears like a spherical object that moves across the scene. An atom will have a random radius, color, and velocity. As each atom sprite collides with another atom they will animate a fade transition (the implode() method). * A spherical looking object (Atom) with a random radius, color, and velocity. * method called implode() implements a fade transition effect. * Change the velocity of the atom particle. * When encountering another Atom to determine if they collided. // if an object is hidden they didn't collide. * Returns a node casted as a JavaFX Circle shape. * @return Circle shape representing JavaFX node for convenience. To obtain the source code please download the link to a jar file below by using the ‘Save link As‘ option in your browser. If you are on a Windows system you can change the extension from ‘jar‘ to ‘zip‘ to be easily expanded. It will contain a directory ‘src‘ with the source code. The published version of the source code is at the GitHub called (JFXGen) for you to clone and fork to your hearts content (It’s there for you to use for your own projects). Enjoy. This entry was posted in Game Programming, JavaFX and tagged circle, collision, collision detection, custom node, game loop, Game Programming, games, JavaFX, radial gradient, tutorial on April 9, 2012 by carldea. I’m just starting with JavaFX, triying to code a very simple volleyball-like game, and your domain model is very helpful, specially the physics and collision part. Thank you, can’t wait for the next part. Is the code you provide EXACTLY the same as the code used to compile your example? Because I am running into several errors — and I’m just cut and pasting so it should be perfect. I’ll check the code again. What errors are you getting? Let me know if there are any other issues. Sounds cool… If you have a blog I hope you can share the link some day. Nevermind – my apologies, I see what’s needed now. Thanks for doing this — there is a real dearth of FX 2 materials out here. As I said before: can’t wait for the third part! Thanks for the great work! 🙂 I am finding JavaFX quite cool! I just noticed one thing that I wanted to discuss with you. Cant we use JavaFX’s AnimationTimer class for the game loop? since it actually represents the JavaFX’s own rendering loop. There was a bug prior to 2.1 which caused issues (performance). Indeed! It would be easy to swap out. I’ve not played with the code in awhile to see if things have been resolved since then. The code heavily relies on vector graphic rendering strategy so there are lots of things going on (gradients, effects, etc) in the JavaFX Scene graph, the engine could also be re-written to use the JavaFX Canvas API. I’ve got an error with the KeyFrame constructor, apparently in version 2.2 you need more parameters, could you please check this part of the code? Really nice tutorial for JavaFX game dev. Thanks! AtomSmasher.generateManySpheres : where was circle object declared ? In the code from jroller everything is ok :), but these codes differ. Its blocked mate in windows 8 with java 8 no way to run. Does JavaFX have Multiple Inheritance?